We frequently deal with people that come to us looking for help after having an interaction with the web security company SiteLock or their web hosting partners. To be able to better understand what is going on with their sitaution, we occasionally check up on various websites where people leave reviews of SiteLock as that helps us to keep up with the various shady stuff that SiteLock is up to. It also was out of line with the amount of and view being expressed in reviews we saw being left at other websites. The other thing that stood out was that most of the reviews seemed to be people who were describing just interacting with SiteLock, which could have explained some of why they had positive comments about them as many of the problems are only realized later. I prefer to leave a review when I am ready but SiteLock insisted so here is my experience thus far. I became a customer after being hit by defacement hackers. They were able to get my site back up after a few hours. Their customer service is good in the sense that they walked me through their portal and call me to provide updates. At present I feel like they are trying to get more money out of me after I have already paid quite a bit. They want me to pay an additional monthly fee per site to upgrade my firewall once I get a new SSL certificate due to Google’s new requirements. As having compatible firewalls with Google’s SSL certificate is a requirement now, I feel it should be part of the basic package and I should NOT have to pay more to get a firewall that is compatible. If a firewall isn’t compatible and will shut my site down, what am I paying for? Why even bother selling something that doesn’t work? The basics should be enough to keep my site functional! I shouldn’t have to pay additional just to get a firewall that will keep my site functional. This service is totally a waste of time and money. Once they have you locked in to their contact that’s the last you will ever hear from them. Do yourself a favor and hang up when they call. Not much more than a scam business in my opinion! 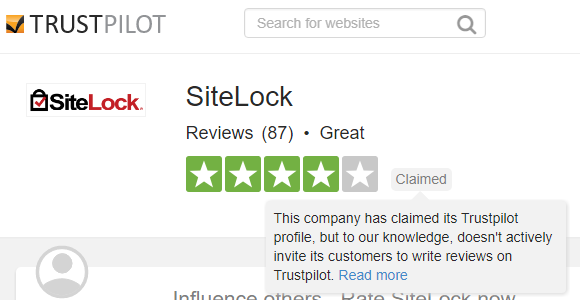 Some of the other recent reviews that SiteLock doesn’t appeared to have tried to take down seem equally bad to us, but maybe the accurate reference to them scamming people is what made the difference here. While SiteLock has well earned poor reputation that doesn’t mean that if they or one their partnered web host with a claim that your website is infected with malware or is otherwise hacked that isn’t true, as we have seen many people incorrectly assume. What we would recommend you do in that situation is to get a second opinion as to the whether the website is in fact hacked. For someone to be able to do that, you should first get any evidence that the web host and or SiteLock will provide, which usually is something that should have already been provided to you. We are always happy to provide that second opinion for free and we would hope that others would as well.